Slightly-heavy, almost-cakey, perfectly crusty and totally delicious challah – all with 100% whole wheat flour! In the bowl of a stand mixer fitted with a dough hook, combine yeast, sugar and ½ cup of warm water. Mix lightly to incorporate ingredients, then allow mixture to sit for about 5 minutes, until it starts bubbling. Add remaining water, salt, honey, eggs and oil. Turn mixer to low and add the flour, about two cups at a time, until all flour has been added and a dough is formed. Knead dough on medium-low for about ten minutes, then cover the dough and allow it to rise for about an hour and a half. Grease oval shaped "challah" pans OR a baking sheets and set aside. Divide dough into 5 equal portions for small challah loaves, or 3 equal portions for large challah loaves. Divide each portion into 3 or 4 strands and braid into a loaf. Place each loaf into a "challah" pan or on a baking sheet. Brush the top of each challah with beaten egg, then sprinkle sesame seeds over it. Bake at 400°F for 5 minutes, then lower the temperature to 350°F and bake for an additional 30-40 minutes, depending on the size of the challah, until golden brown. Cool breads on a wire rack. Recipe created by Overtime Cook. 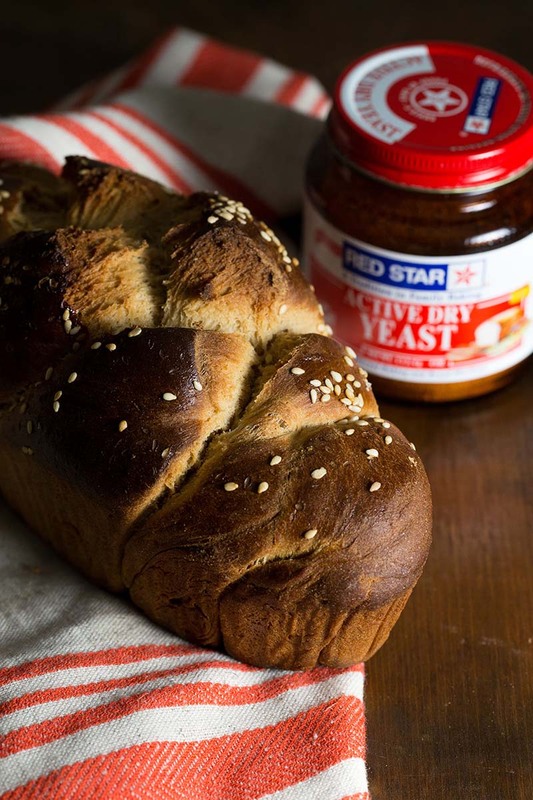 If you like a sweeter challah, add 1⅓ cups honey. If you prefer yours less sweet, add just a cup of honey. Plan Ahead: This challah freezes nicely. Cool completely then store in an airtight bag. Reheat straight from freezer until warmed through.